I get these fuzzies on the buttom of the v channels. Any ideas why? I can hit them with a brush and some will go away but there is a slight ridge of wood left in the bottom of some letters. I suggest you try 60 ipm. Also you did not mention doc. Run a second pass at full depth right afterwards. Slow down your feed rate to 60. If that does not work give the results you are looking for follow up with another pass at full depth. What do you mean by “full depth”. I do not have a flat depth set for this job. Are you talking about setting the pass depth to a deeper setting? 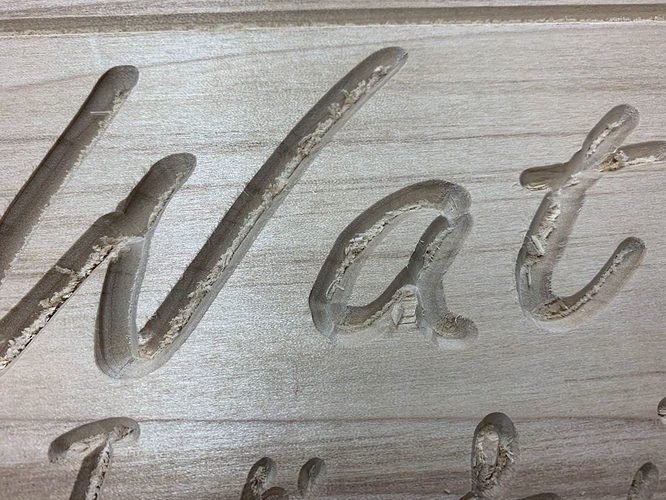 If so, how do I know that depth since vcarves are cacluated? Donnie he is saying that you should run a separate program where you run the program again with 1 pass (instead of the 4 or 5 you have it do the first time you run the program) That way the router will carve to the bottom in one swipe to attempt to clean up the fuzzies. what is happening is that the bottom of your bit isn’t being able to have the contact surface area to clean it out… like the higher portions of the bit do. sometimes running the design again helps catch the fuzzies. Ok you had your doc set at 0.1 per pass. I am guessing that your text with 60 degree bit has max depth about 0.13 to 0.18. 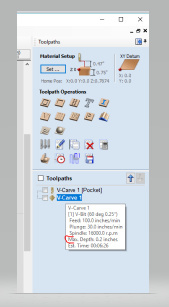 Hover your cursor over the tool path and Vectric will show you max depth. This means that two passes was required. For that second pass set your doc per pass at 0.2. The max depth will not change as it is determined by the width of the text. 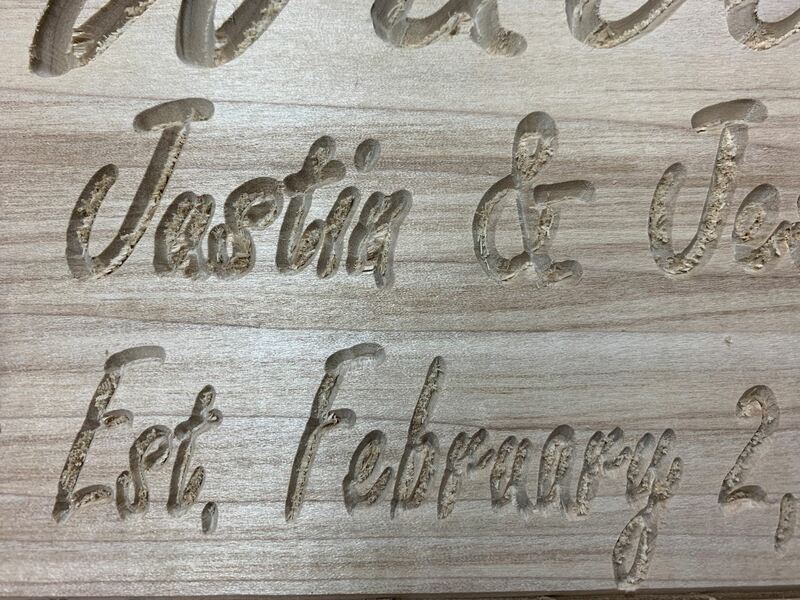 Now this clean up carve will be relatively quick as it will only be one pass. Keep in mind that the point is virtually 0 diameter so it is almost dragging through the wood. Granted that just above the point there is some diameter.